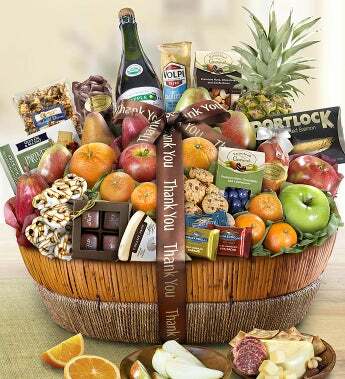 Say Thank You in a big way with this deluxe basket filled with premium quality gourmet foods, fruits, and sweets. This handsome wicker basket is tied with a Thank You satin ribbon and is filled with six types of fresh fruit, nuts, snacks, chocolate and much more. This gesture of thanks will be a gift to remember!